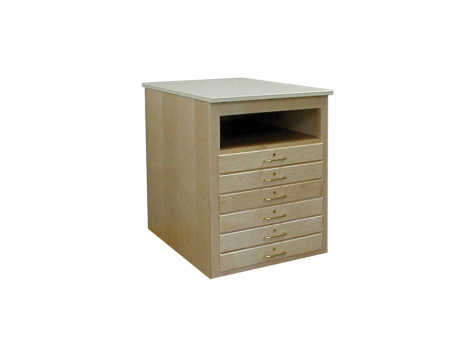 The cabinet is constructed from hard maple solids and panels. Each locking drawer measures 2"H x 20”W x 26”D. The upper storage area is 21”W x 28”D x 6-7/8”H. The 3/4" thick Fiberesin top is 24-1/2”W x 32”D. Overall size of the unit is 24-1/2”W x 32”D x 32-3/4”H.